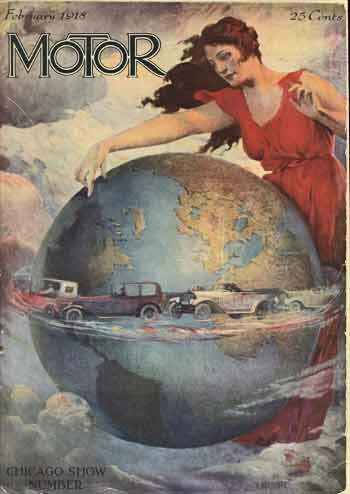 February 1918 cover. A long-haired goddess wearing a scarlet, loose-fitting gown and floating among the clouds reaches down to touch the earth. Cars driven bumper to bumper circle the equator. Muralist/poster designer/illustrator Vincent Aderente (February 20, 1880 — January 13, 1941) was born in Naples, Italy. At age 6, he joined his parents in emigrating to New York, and as a teen, studied at the Art Students League. By the ripe old age of 16, he was already working with a talented muralist of the day, Edwin Howland Blashfield, who painted the dome mural at the main reading room in the Library of Congress. As Aderente assisted Blashfield, starting with the ballroom ceiling at the Waldorf-Astoria Hotel and continuing a span of thirty years, he also developed his own talent and took numerous independent mural commissions. His commissions included work at the Detroit Public Library; the New York State Courthouse in Jamaica, Queens; the Denver Mint; the ceiling of the Boston Opera; St. Matthew's Cathedral in Washington, D.C.; and many other public buildings. The year of his death, he was still working on murals of the life of Abraham Lincoln for the Main Branch of Brooklyn's Lincoln Savings Bank. Additionally, Aderente was a successful book and magazine illustrator, contributing to Scribner's, Cosmopolitan, American Weekly, Hearst's International, and others. He also designed several WWI recruiting posters. His usual themes included depictions of large, romantic, mythic figures symbolizing various virtues or inspiring viewers to heroic dreams.